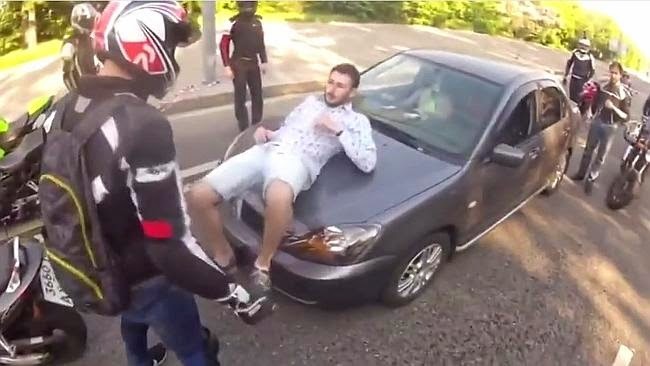 AFTER a group of bikers pulled a man out of his car in front of his horrified girlfriend she could never have imagined what happened next. Video shows that the man pulls out in front of the pack of bikers at which point they block the couple’s car in and furiously start shoving him around. When they throw him on to the bonnet of the car his girlfriend gets out of the vehicle. Just as things looked set to get worse, the man gets down on one knee and asks the stunned girl to marry him. Not only that but these rough and tough bikers reveal a bouquet of flowers for the woman and start applauding. The video was posted in Russia and while the couple has not been identified, their love story has clocked up more than 3,600,000 views. Unconventional? Sure. But it is one wedding proposal this bride-to-be will never forget.